You can specify how the entered search criteria for Plat Number, Project Number and Termini is supposed to be applied by selecting from the drop down box next to each field and selecting: the whole selected field, contained in the field, beginning of the field, or end of the field. 2. 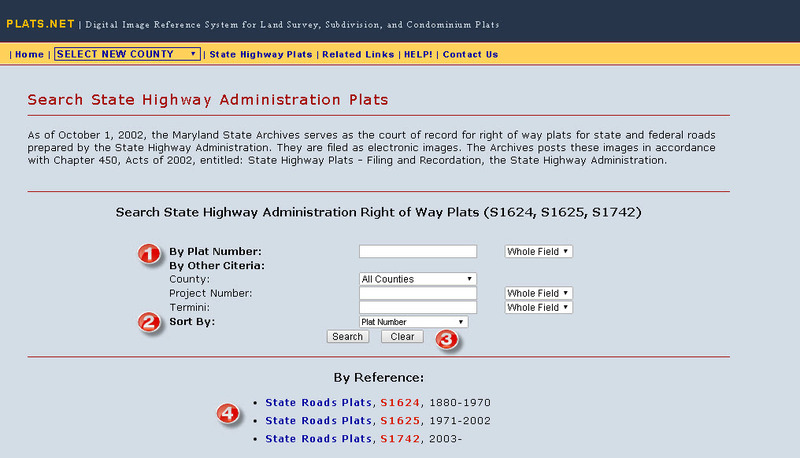 From the Sort By list, you can choose to order your search results by Plat Number, County, Project Number, Termini, or Accession Number. 3. The Clear button allows you to clear the search form. When a search is performed, you will be redirected to the Results Page which displays the records that matched your search criteria. Series - Clicking on this link will let you browse through a list of plats within that series available within PLATS.NET. Series number - Clicking on this link will take you to that series in the Archives' catalog web site Guide to Government Records.